When you want shrimp, but not the same old ways. Here’s something different to try. The recipe is so easy & quick to prepare…and the fresh lemon juice gives this dish a bright pop of freshness. In a skillet, fry bacon until done. Drain on a paper towel. Crumble & set aside. Reserve the bacon grease. In a saucepan, bring the broth to a boil. Add the grits, stir & cover pan with a lid. Remove pan from the heat. After the grits have absorbed the broth. Stir in the butter, salt, pepper & cheese. Cover & set aside. Meanwhile, remove most all of the bacon grease from the skillet. Heat grease & add the shrimp; sauté. When the shrimp start to turn pink; add the remaining 5 ingredients & sauté until shrimp are done about 2 minutes. Add the bacon back to the skillet. 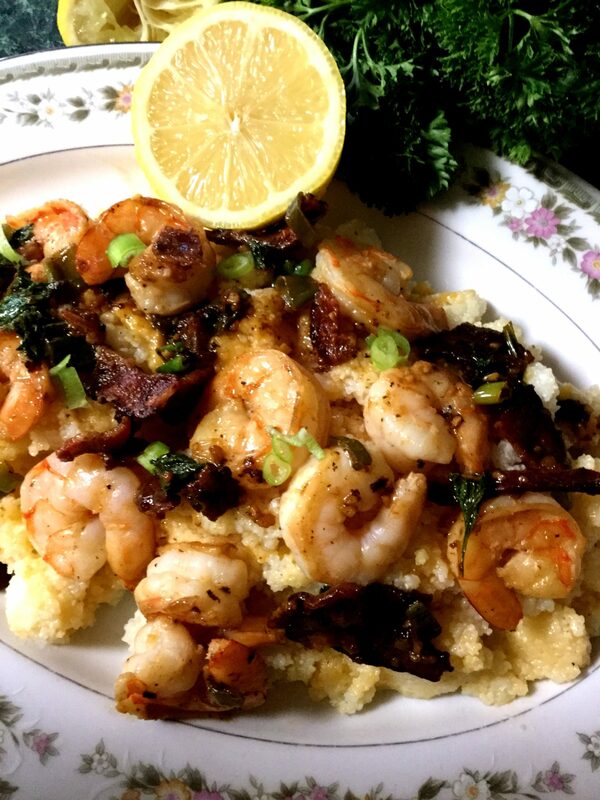 Serve the shrimp mixture on top of a bed of cheesy grits.